This system was inspired by Mrs. Patton over at Patton’s Patch. Check out her post on linking spelling to reading here! I wanted to use a word collection book as well. My ELL students need practice and familiarity with many different types of word patterns and spelling rules. I am going to use Word Detectives during morning meeting and Reader’s Workshop. At morning meeting, I will introduce the new word category…then we will brainstorm a list of words that fit this category together. During Reader’s Workshop (Read to Self), my students will use the small Word Detectives book to record words they find in their reading that fit the previous categories we have discussed. 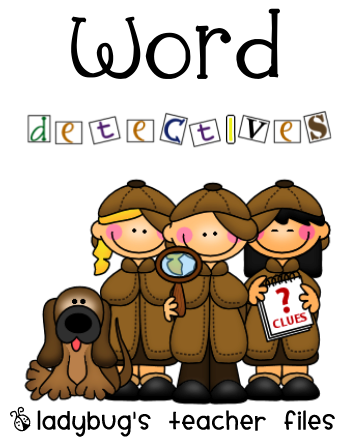 The files I am sharing tonight are Part I of my Word Detectives post…I will be sharing the second part later this weekend (how I will display each new category). Here are the files…more to come soon! Note: To create the book cover, I am printing it on cardstock, then folding the paper in half. When printing the PDF, I selected “No automatic page scaling” to keep it like my original…which took me FOREVER to space out perfectly so it would be easy to fold!! Love this and can't wait to see the second part! Thanks for all of your sharing! What a great idea. I too have 13 ELL learners in my class and I am finding this is a much needed skill for decoding words. I look forward to the remainder of your ideas for this . Thanks so much. I am really excited about this idea, but am anxiously awaiting the second part of the file to see exactly what the book will look like. I hope you will soon be able to post it. Thanks so much for your help with this idea!!!! I think I may make this part of my centers, so that kids are watching out for words with the pattern we are working on! Thanks for sharing! Thank you! I already follow your blog, but I just googled "Word Detectives" to find a cover for my students' notebooks and this post came up! I love the covers you made! What a great idea! I think I will use this with our spelling words, "dead" words (like said, like, went, etc.) and I can also include new and interesting words. Each child will have their own binder for reference.